Japanese Aircraft Carrier Chiyoda in 1943. Chiyoda and Philippines are closely related worlds. In the batttle of Leyte Gulf, the Chiyoda carrier was sunk together with her twin the aircraft carrier Chitose. The origins of the carrier Chiyoda are similar to her sister, the Chitose aircraft carrier. 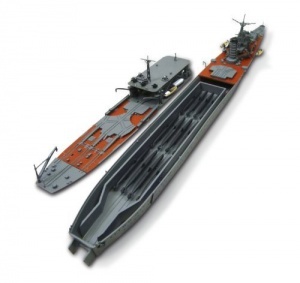 Both evolved from the former Chitose-lcass seaplane tenders into light aircraft carriers of the Imperial Japanese Navy. The seaplane tender Chiyoda, ordered in 1934 and commissioned on December 1938 operated as seaplane tenders during the Second Sino-Japanese War and early stages of the Pacific War until the Battle of Midway, which determined their conversion to light aircraft carrier. Chiyoda means in Japanese for “field of a thousand generations”. The original design planes of the Chiyoda were very flexible and were intended to build a ship with many different capability, among them speed was one of the fundamental ones. Indeed, the hull and engine design was based on a high speed oiler vessel, with a maximum speed of 20 knots (37 km/h). The air group consisted of 24 float planes operated from four aircraft catapults for launching seaplanes, and cranes for recovering landed aircraft on her aft deck. The Chiyoda had Kawanishi E7K Type 94 “Alf” and Nakajima E8N Type 95 “Dave” floatplanes. Her armament consisted of four 12.7 cm/40 Type 89 naval guns and twelve Type 96 25 mm AA guns. Japanese Seaplane Tender Cruiser in 1938. The 12.7 cm/40 Type 89 naval gun was a Japanese anti-aircraft (AA) gun introduced before World War II. It was the Imperial Japanese Navy’s standard heavy AA gun during the war. The Type 89 was adopted by the IJN on February 6, 1932, and was the primary anti-aircraft gun on new aircraft carriers, battleships and cruisers, most commonly installed in twin gun mounts. 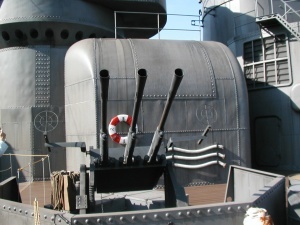 As IJN ships were upgraded in the 1930s and 1940s, their older AA guns were often replaced with Type 89 guns. 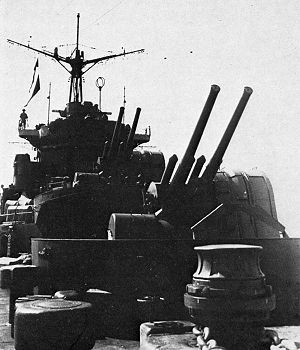 The 12.7 cm/40 Type 89 naval gun mounted on Chitose Seaplane tender in 1938. Inspired by French engineers, first models were built in France under the designation “Type 94” and “Type 95”, with the mass production model produced at the Yokosuka Arsenal being designated “Type 96”. The final Type 96 25mm Gun was an automatic cannon used by the Imperial Japanese Navy during World War II. A local built variant of the French Hotchkiss 25mm anti-aircraft gun, it was primarily used as an anti-aircraft gun in fixed mounts with between one and three guns. As general evaluation, this machine was more comparable to the 20mm Oerlikon, but drastically inferior to the 40mm Bofors weapons used by the US except rate of fire (and only barely in that respect: the Bofors could put out a sustained 120 round/minute because of its constant-fire top-fed ammo clip design; whereas the 25mm’s frequent ammo box changes lowered its nominal rate of fire to only half of its theoretical maximum of 260 rounds / minute). Some problems were detected by the Japanese when using this weapon aboard the vessels: (1) Elevation and traverse was too slow (2)The sights were ineffective against high speed targets. (3) Firing the multiple mounts caused excessive vibration which reduced accuracy and prevented effective target tracking. (4) Too little ammunition in each magazine resulted in a low overall rate of fire (the gun used 15 round self-contained magazines). During the Second Sino-Japanese War, the Chiyoda Seaplane Tender cruiser operated together with the seaplane tender Kamoi and carried out combat operations in China until May 1940. At that time a major re-configuration led to reduce the aircraft capacity from 24 to 12 with her aircraft capacity reduced from 24 to 12 aircraft, and the space used to store 12 Type A Kō-hyōteki-class submarines. This is one of the differences compared to the Chitose because the latter never operated submarines. After conversation to light carrier in December 1943, she performed training and transport missions until the Battle of the Philippine Sea on 19 June. She was part of the Van Force with carriers Chitose, Zuiho, battleships Yamato, Musashi, Kongō, Haruna and cruisers Atago, Takao, Maya and Chōkai. She was hit by a bomb on 20 June on her aft flight deck, which killed 20 crewmen, wounded 30 more and destroyed two aircraft. Chiyoda Seaplane and midget submarine tender configuration. model kit at 1/700. A task force included Zuikaku, Zuihō , Chitose and Chiyoda, without aircraft and accompanied by converted hybrid battleship-carrier Hyūga and Ise and cruisers Oyodo, Tama, Isuzu tried to decoy the main American carrier forces on 20 October 29144. During the Battle of Cape Engano, and by means of a combined surface fire and aerial bombing, the Chitose and Chiyoda carriers were sunk. 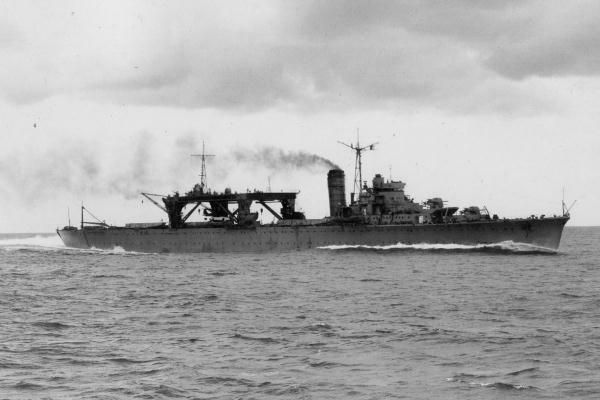 First, the Chiyoda aicraft carrier was severely damaged and numerous efforts were done by battleship Hyuga and cruiser Isuzu to rescue and tow the damaged her. However, these efforts were not successful due to the constant danger to attack by American carrier based aircraft and surface fire. No survivors were reported and US forces.